Take a different look at the things in your home that get thrown away when they are empty. Things that can be re-used to give you all the cheap storage for your crafting stash that you could possibly need. Maybe you have some really good ideas for storage ... well here is the place to share them. This is the link that will take you to the page for your comments on any tips and hints that you may have and would like to share. Here I have utilised food containers, the kind you get with takeaways in them. They are cheap to buy and make excellent containers for all your small items. 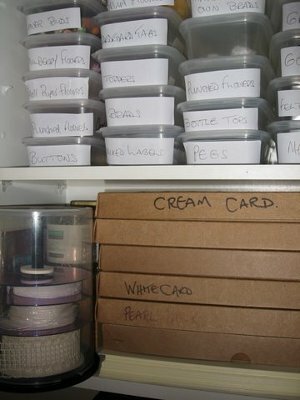 Label them with the contents and stack them on top of each other, and you will always have to hand what you need. The boxes in which I purchase my card and papers makes an excellent place to keep the card clean and tidy...no curled edges for me thanks! 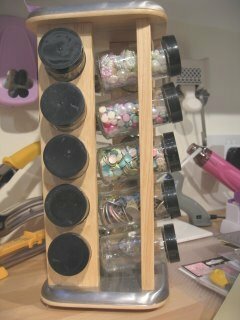 Here I have used an empty CD tower to store ribbons in as it makes one of the best Crafters Storage items you can find. 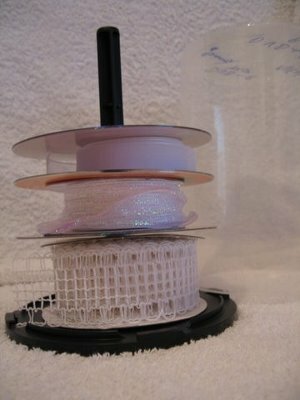 Colour match them and use old CDs to seperate them, and to make it easier to pull the ribbon out. 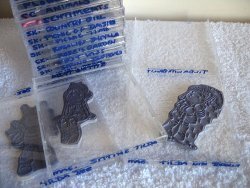 And replacing the clear cover keeps them free from dust, until they are ready to be used again on my projects. 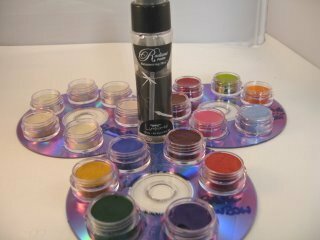 The same item can be used to store your paints in too. But leave the pots to air dry before you replace the lid to the tower. 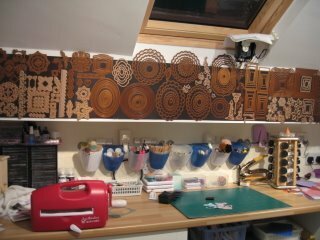 And the taller CD towers can be a good place to house all your small pots of Liquid Pearls, glues or even your Spritzer bottles, keeping them all neat and tidy on your work top. 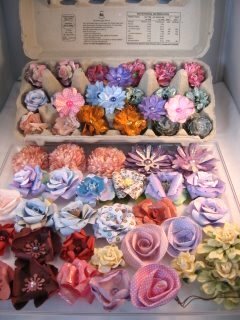 I love to make Paper Roses and I need some where to store them until I am ready to add them to my cards. What could be better than an empty egg carton that would otherwise have been thrown into the rubbish bin. Magnetic sheets have been attached to the wall with Velcro dots and it is the perfect solution for storing all my Spellbinders. 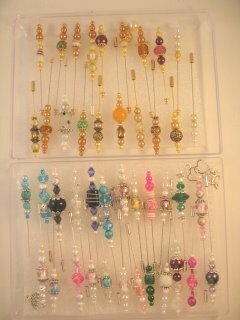 Storing the Hatpins that you make in a clear chocolate box is perfect as you can see instantly what you have....and the chocolates were delicious too. Use empty CD Jewel cases for storing all your unmounted rubber stamps, it keeps them clean and neatly stored. It also prevents damage to the rubber, which would spoil the image when you want to use them. 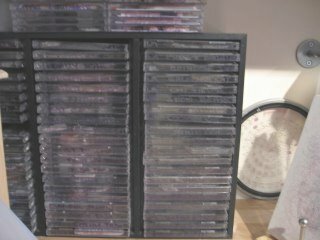 ... and when you have a few all done then store the cases in an old CD storage rack with the labels facing outwards so that you know what is in each case. An old Spice rack is excellent too. Get rid of all those musty spices and herbs that you are never likely to use and store all your tiny gems, pearls, buckles, brads and flower centres safely inside.